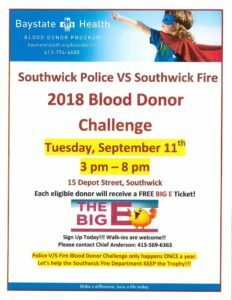 Please consider coming down to the fire department on 9/11/2018 to donate blood! The Baystate medical center blood mobile will be at 15 Depot Street between the hours of 3-8pm. Make sure you mention your coming down to represent Swk FD! Eligible donors will also receive a free ticket to the Big E! Whoever you support make sure you come down to donate, its always needed. Please join us tomorrow for our annual 9/11 remembrance ceremony as we pay tribute to the 343 first responders who lost their lives in the attack. 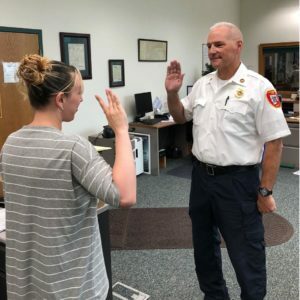 Southwick’s new Deputy Fire Chief Rich Stefanowicz was sworn in today! Welcome to the department and good luck! Congratulations to Southwick’s New Career Firefighters! 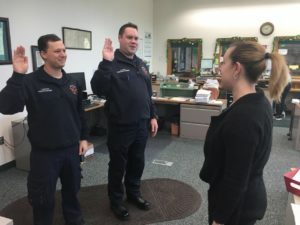 Congratulations to Southwick’s New Career Firefighters Ian Dipietro and Zack Kareta being sworn in by Assistant Town Clerk/ Treasurer Jessica Menzone! 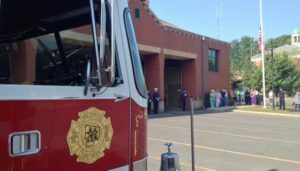 The Mission of the Southwick Fire Department is to ensure the safety of our residents and guests of our community. To protect life, property, and the environment from fire, medical, disaster, and hazardous materials related incidents by providing emergency services, public education and code enforcement. To provide a work environment free of discrimination and harassment. © 2019 The Southwick Massachusetts Fire Department. All Rights Reserved.